I loved looking at Alton Brown’s Enchilada Lasagna, but I just didn’t have the time to make the sauce and I don’t normally have cumin seeds laying around to toast. Therefore, loosely based on the method he used, I came up with a easier and inexpensive method of making this dish. Everything can be purchased at Aldi except for the enchilada sauce…. I don’t think ours carries it. And no rolling up those tortillas! 1. In a skillet, heat the oil and add the chicken until cooked through. Remove chicken. Decrease heat to medium low. Add onion and salt to the pan and allow to sweat 4-6 minutes. Add oregano and cook another 2-3 minutes. Add the chicken back to the pan and remove it from the heat. 2. Preheat oven to 350 degrees. Spray a 9×13 pan with cooking spray or line it with non-stick foil. Pour about 1/2 of a can, or 1/2 a cup or sauce on the bottom of the pan. Dip 3 tortillas in enchilada sauce or brush them instead. Layer that on top of the sauce. Top with half of the chicken mixture. Top with 1 cup of cheese. 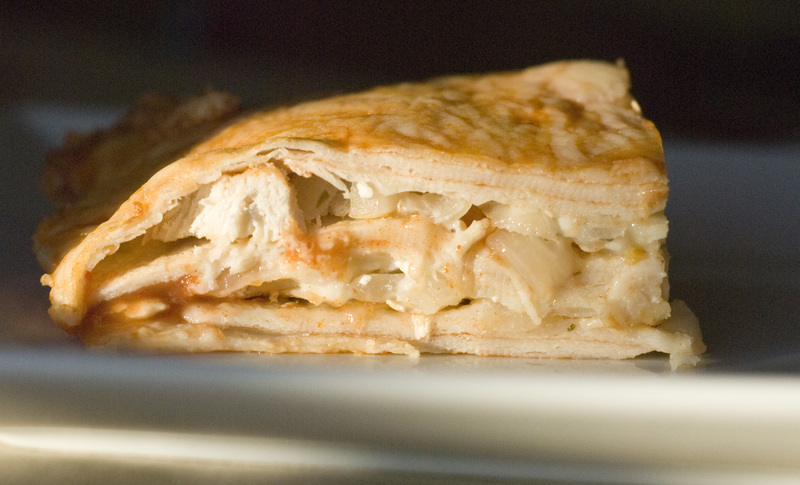 Repeat layers with 3 more tortillas, half the chicken, 1 cup of cheese. Then 3 more tortillas. Pour remaining sauce on top. Last, 1 more cup of cheese! 3. Cover the pan with foil and bake 30 minutes. Remove foil and cook another 10 minutes. Enjoy!